Focusing on the landscape of the American West, Lithic Habitats explore the connections between natural architectural forms and man-made structures. Humans have long elevated rock formations to iconic and sacred destinations meant for pilgrimage and exploration, as well symbols of national and state identity. This inspiring landscape is often contrasted with weathered man-made buildings throughout these vast states. Using ideas of awe and discovery of the western landscape, the works dialog about the reverence, exploration, and refuge in the land. Rose Nestler’s installation emulates the hue surface similarities between lavishly upholstered objects and smooth undulating rock forms. She has re-interpreted these sublime spaces on an intimate scale, and through her choice of materials, comments on the idea of the feminine and mysterious in nature. Constructed with hand-upholstered cushions in luxurious fabrics, referencing 19th century aesthetic style and craftsmanship of decorative objects the installation fills the gallery space forcing viewers to explore and touch their crowded expanses and cavernous corners, creating a small maze not unlike the Essex Street market itself. This uncharted landscape inside the gallery would be in contrast to the well-known Lower East Side and within the sanctity of the installation, participants experience an immersive, tactile and momentarily respite from the outside urban environment. In contrast to Nestler’s installation are Robin Stein’s photographs of stark dwellings dotting the desert landscape, whose residents are utilizing the land as a habitat, albeit its hostile and unyielding characteristics. His series examine the idea of frontier and changing landscapes, interrupted by man. Taken predominantly in largely isolated towns in the West, these images examine a different kind of exploration and haven within the land itself. Nestler and Stein’s collaborative audio work is a collection of environmental sounds sourced from western rural areas as well as around the installation site in the Lower East Side. Rose Nestler currently lives and works in Brooklyn, New York where she is a residing artist at a Chashama Studio Program in the Brooklyn Army Terminal. Through installation, drawing, and sculpture Nestler develops spaces that are illusionary yet familiar. Themes of historical architecture, ornamental objects and untamed natural landscapes create the formal basis for her works. Nestler received a BA in Fine Arts and Art History from Mt. Holyoke College in 2005 and now works as a Teaching Artist. Her work has been exhibited in the New York area at a variety of galleries and community organizations including, NY Studio Gallery, Arts @ Renaissance, International Studio and Curatorial Program, Proteus Gowanus and the NARS Foundation. Nestler has been an artist-in-residence at Vermont Studio Center, Supporting Women Artists Project and Byrdcliffe Artists Colony. Robin Stein is a multi-disciplinary artist based in Seattle, WA. Primarily working with photography, moving images and sound, his work is rooted in an inquisitive and adventurous exploration of geography, history, and human interactions with the built and natural landscape. His photography, installations and music have been recognized and exhibited widely, having shown in venues in New York City, Los Angeles, Chicago, Mexico City, Seattle, and Portland. Zeina Assaf is an arts administrator, independent curator and artist living and working in Beirut, Lebanon. Curating emerging to mid-career artists since 2006 at both non-profit and commercial spaces such as Cuchifritos Gallery/Project Space, artHARLEM, and NY Studio Gallery. She is currently working at 98weeks Research/ Project space. 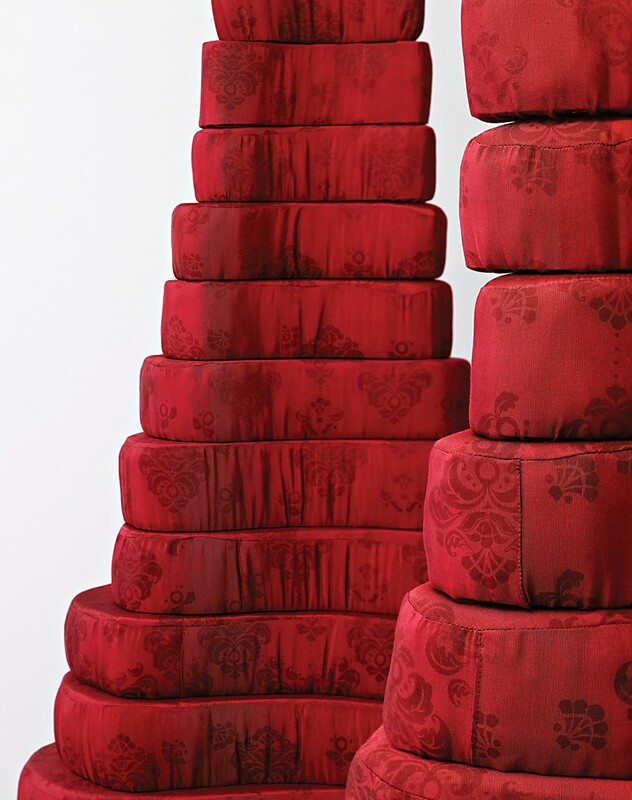 Image: Crimson Expanse, Rose Nestler, screen printed fabric, foam, wood, variable dimensions, 2012. Photograph by Austin Kennedy.